The Stanford Cardinal (13-11, 7-4 Pac-12) are set for a road trip to Utah and Colorado this weekend, where they will play the Utah Utes (13-9, 5-6 Pac-12) on Thursday night in Salt Lake City and the Colorado Buffaloes (13-10, 5-6 Pac-12) in Boulder Sunday afternoon. 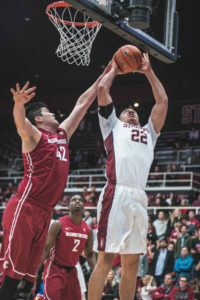 Stanford enters Thursday’s game on a two-game win streak after defeating the Oregon State Beavers and routing the Oregon Ducks with a spectacular offensive performance at Maples Pavilion last week. The Cardinal are currently tied for fourth in the Pac-12 standings. Reid Travis manages to attack the basket despite a tough defense. Travis is one of the veteran stars that help lead the Cardinal. The Cardinal might be the favorite for both games if not for their struggles on the road this season. They are 2-7 in games not played at Maples Pavilion this season, and have not won a game at Utah since 2013, with the Jon M. Huntsman Center being a notably tough place to win for any away team. Stanford will undoubtedly look to senior guard Dorian Pickens to have another stellar performance, after he lit up the Oregon Ducks with 25 points and 5-6 shooting from beyond the arc. Pickens is Stanford’s second-leading scorer this season behind senior forward Reid Travis, averaging 14.4 points a game. Tipoff in Utah will be at 5 p.m. on Thursday evening and will be aired on Fox Sports 1. Sunday’s contest at Colorado can be seen on on the Pac-12 Networks at 1 p.m.